Applications for PFM 2018 are closed. 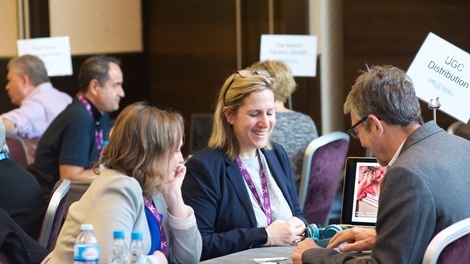 The Production Finance Market (PFM) is our annual two-day financing event for film and TV Drama, run in association with the BFI London Film Festival. Now in its 12th year, the Market has helped forge countless long-term business connections, and is the only event of its kind in the UK. This year the PFM will include High End TV Drama to the lineup. This has come as a direct response to feedback from financiers from the last few years and illustrates the importance of TV Drama within the production community. On top of this, we will also be selecting up to 10 High End TV Drama projects to be fast tracked to the prestigious Content London Drama conference in London in November, an exclusive benefit from attending the PFM. The main strand is for projects with budgets above €1m, and the New Talent Strand, which is supported by Creative Skillset, is for projects with budgets below €1m. The Market will run 16-17 October 2018 as part of BFI London Film Festival. Which market strand is for me? PFM is open to international feature film and TV Drama projects with a production budget over €1m. New Talent Strand (formerly the Micro Market) is open to feature film projects with a production budget under €1m. The Market launches with a keynote speech delivered by an industry leader. Our 2017 Keynote address was lead by Elizabeth Karlsen from Number 9 Films. Past speakers have also included Ben Roberts, director of BFI Film Fund, Michael Barker, co-president of Sony Pictures Classics, Alison Thompson, managing director of Sunray Films and Danny Perkins, UK CEO of STUDIO CANAL. The Market comprises intense networking and pitching meetings between financiers and producers. Taking the form of speed dating sessions, producers have 20 minutes to impress each financier before moving on to their next meeting. This streamlined schedule enables producers to meet many more financiers than usually possible. Delegates can also attend expert panel sessions discussing new developments in film.